The other day I was putting away some folded laundry on the bed that my wife didn't have time to put away. Without thinking, I put my own stuff away and left hers laying where it was. After thinking about what I had done, I realized that I have somehow picked up the lame excuse of "Well I don't know where all her stuff goes." 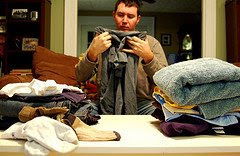 After checking a few drawers, I realized that, yes, I could put the clothes away in their place with confidence, and that my reasoning of not knowing where things go was just an excuse not to take an extra thirty seconds and give my wife a little help. And so, I have once again seen an area in which I haven't been giving 100%. This marriage thing takes constant work, but it sure is worth it, isn't it? I came to that same realization recently. Just be careful how far you take it--I decided to also try to take on folding the laundry and landed myself a stern reprimand. Actually, here's a more helpful comment. This is related to something that happened recently: we were going somewhere, and I knew it would be awhile until we ate something, so I stuck a granola bar in my pocket to tide me over. So we get there, I unwrap the granola bar, and I my wife is looking at it, and I realize, mouth open, granola bar on the verge of going in, "Oh my gosh, I just made a HUGE mistake!" Sure enough, she said, "You didn't grab one for me?" Not accusingly, just kind of disappointed (which is way worse). Now I'm extra careful to try to remember her when preparing for things like that. Great post. After my husband did this to my laundry a few times, I just stopped doing his. When he asked about it I said, "Well, I gather it, throw it in the wash, then the dryer, then fold it and/or hang it and put it away. If you can't put MY stuff away after I fold it...."
I didn't say it snotty, I swear. But he said I was right, and now actually washes and dries sometimes too! My wife asked me NOT to put her laundry away. So I wash, dry, fold and put on her dresser. I would be estatic if my DH even got near the laundry much less put it away. As long as it made it in vicinity of the right place, I'd be good with it. This was classic. My husband has been guilty of the laundry thing - and I know he's a good, kind man. When I confronted him about it, he was just a little stunned. It hadn't even occured to him to put mine away. I asked him what would happen if I took that same stance around the house? Only washed my dishes, made my side of the bed? Cooked only enough for me? Only considered my own needs on pretty much everything? He was a little horrified thinking about it. I'm starting to understand that y'all are just wired a little different. Nurturing and care-taking doesn't come naturally like it does in most women. That doesn't excuse inconsideration - but it does explain how a sweet man can completely disregard the needs of others without realizing what he's doing even. I too get into the trouble of when I do things around the house it's not always up to snuff, but I'm getting better at actually putting her clothes away. It's really a matter of training to actually look around for something to do. I guess I've been trained for too long to "respond to interrupts" rather than actually go out looking for things to do.